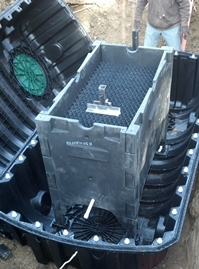 The evolved plastic tank is quickly becoming accepted by contractors, designers, and homeowners and because of the variety of size options available to satisfy varying needs. Changing environmental challenges, market conditions, and regulations are all playing a role in the evolution of new tank designs. Advanced wastewater treatment for limited and sensitive sites and rainwater harvesting for potable and non-potable water use are two major areas demanding new approached to tank construction and use. The need for large tanks that can be easily transported to often remote sites is another catalyst spurring the move to lightweight but durable plastic tanks. Tank materials are essential to the function and usage/purpose of the tank and leakage is always a major concern. While concrete is still the most common material for wastewater tanks, recently plastic and fiberglass tanks have become more common in the marketplace and are preferred for rainwater capture and potable water systems. Plastics and fiberglass are inert to wastewater constituents, a benefit for product longevity, and they are notably lighter making them ideal for difficult access sites. Due to new manufacturing technology, plastic tanks now offer not only increased strength as compared to plastic tanks of the past, they are lightweight and easy to transport and install. Plastic tanks that are manufactured by the rotational molding process are typically a one-piece tank and thus minimize leak potential. Additionally, plastic tank designs have been introduced with a new technology of continuous gaskets, which are common in the pipe industry, and the inclusion of a fixed, permanent connector system to lock the seam in place. For these reasons, the evolved plastic tank is quickly becoming accepted by contractors, designers, and homeowners and because of the variety of size options available to satisfy varying needs. In most areas of the United States and Canada, codes still state only that a watertight tank shall be provided without verification, although this is beginning to change as some recent code alterations require testing to ensure tank watertightness. This is where best manufacturing processes and technological developments have been developed to meet the new requirements including the development by The National Precast Concrete Organization of the Septic Tank Manufacturing Best Practices Manual, which explains, "with the increasing regulatory demands for structurally sound and watertight tanks, it is critical for precast concrete manufacturers to continually raise the bar on quality. And, that proper installation of the tank is absolutely critical for maintaining structural integrity and watertightness." Additional advances in manufacturing process related to plastic tanks have resulted in increased strength and durability over the tanks of the past. The manufacturing process allows the inclusion of corrugations and ribbing to strengthen the tank. Interior structural bulkheads can be included to increase the strength of the tank. Recent, significant breakthroughs in injection molding have allowed larger tanks (1,500 gallons) to be manufactured and offer many benefits. The tank has a consistent wall thickness and the process allows for a much higher strength plastic material. This yields a high-strength yet low-weight tank, and the tanks are conveniently manufactured in "halves," allowing the tanks to nest for increased shipping density. In septic system applications, the need for compact systems for small lots and for systems in environmentally sensitive areas is serving as a catalyst for tank innovation including increased safeguards to ensure watertightness. On difficult sites, the ability to install a tank in a shallow, low-profile configuration to leverage the available space while avoiding rock or problematic soil conditions is another need pushing designers to innovate. Environmental regulations have required single family residential wastewater treatment systems in various ecological hotspots across the country. The vessel that houses the treatment system is the tank. This key component must allow for design flexibility, ease of component installation, and provisions for maintenance. Tanks have incorporated these design features to address the regulations and provide solutions. Applications such as rainwater harvesting for non-potable and potable use are coming to the forefront of the tank design arena. Economics and the higher costs of a depleted resource like water are helping to increase the popularity of diverse tank designs and related applications. The desirability of whole house potable water systems that collect rainwater from the roof and treat it to potable drinking standards is an area where plastic tanks excel and one growing rapidly in demand in areas not served by public water. In the case of rainwater harvesting, homeowners now can have options other than using treated potable water for their non-potable uses such as irrigation. During the summer months, irrigation demands can be the greatest percentage of use for a homeowner. Installing rainwater harvesting tanks can relieve potable demand stress from the utility district and also save the homeowner on water bills. During dry summer months, when many districts have limited lawn watering, car washing, and other water-intensive uses, the rainwater harvesting system gives the homeowner some freedom. Pump tanks, stormwater runoff storage tanks, and agricultural and chemical storage tanks are also evolving to accommodate new regulations and applications. The acceptance of recycled materials as equals in manufacturing of plastic tanks and the evolution of manufacturing processes result in the production of a consistent, high-quality product. Recycled streams of materials are put through rigorous testing at varying points in the material processing procedure to ensure that minimum product specifications are obtained. Tanks serve many uses. While the tank's function of being a storage vessel has not changed, every other thing surrounding the topic of tanks has changed, including the types of usage, the materials used, and the rules and regulations surrounding tank applications. Advances in tank manufacturing have added to the potential for larger-capacity tanks and for specialized uses such as treatment systems and potable water. These advances have also provided tanks will meet stringent watertight standards. Tanks have changed to be higher quality and strength, meet higher standards, and allow for more uses.